This course and its concentration provide much more than a comparative overview of the tax law and accounting of significant trade nations. The formation, operation, and liquidation of a closely held corporation involve special tax considerations which present unique planning opportunities. This highly informative will analyze these tax issues, and explore the appropriate formation and transition strategies. This course is designed for two groups of professionals with generally opposing aims: the group of in-house tax counsels of a multinational enterprise ("MNE"), accounting firm, or law firm whose focus is achieving the minimum global effective rate of taxation for an MNE and the group of revenue and treasury officials that seek to maximize tax collections with consideration for national economic policies. This course develops an understanding of the role of purchasing and material management in any organization. Topics include purchasing function in an organization, requirement generation, supplier selection and management, pricing principles, cost analysis, contracts and negotiation, value analysis, legal considerations, and ethics/professional standards . 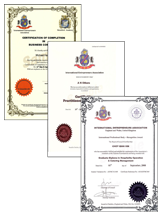 This course will address international treaties for the protection of intellectual property. It will examine the ways in which intellectual property rights are asserted, exchanged, protected, and respected, both in theory and in practice. Special attention will be devoted to the regulatory and strategic considerations involved in the business and legal decisions implicating intellectual property. Intellectual Property surveys the principal tenets of intellectual property, including trademarks, copyrights, patents, and trade secrets. This course is primarily concerned with practices currently being followed to value a closely held business. Emphasis is placed on the many problems peculiar to non-publicly traded interest such as the appropriate discounts for lack of marketability, minority interest, restrictive agreements, and key man. Some attention is given to valuation problems associated with intangible assets such as goodwill, going concern value and covenants not to compete. Other topics, selected by the class participants, have included ESOPS; estate freezes; transfer pricing; valuing options, debt or publicly traded stock. Relevant tax cases and journal articles are used to assess the position of the IRS and the courts where issues of fair market value are contested. Since there are more than two hundred references to the elusive notion of fair market value in the Internal Revenue Code, and many more in the Regulations, there are many such disputes. This course focuses on new venture initiation and preparation of a business plan to generate financing and begin operations. It examines the critical factors involved in conception, initiation and development of new business ventures. Topics covered include identification of characteristics of prospective entrepreneurs, innovations, market potential analysis for new products or services, acquiring seed capital, obtaining venture capital for growth or purchase of an existing business and organization and operation of the new business. Each student is required to develop a business plan which is presented for evaluation. Students wishing to start, develop, acquire, sell or merge a business are encouraged to do so. This course explores the nature and role of creativity in entrepreneurial organizations. Theories and modes of creative thinking and the linkage between creative and entrepreneurial thinking are presented. Cases, experiential exercises, and other methodologies are used in which students will investigate the creative process in a variety of organizational settings. The role of the founder or key managers in nurturing and sustaining a creative enterprise is discussed. The course is designed to open students to the creativity within themselves and their organizations, and to the tools with which creativity can be managed to promote innovation and enhance organizational effectiveness as well as individual member satisfaction.